At the dawn of a new millennium, in an unexpected gesture of recognition for Mr. Balsley’s contribution to New York City’s public realm, a park he designed was renamed Balsley Park. 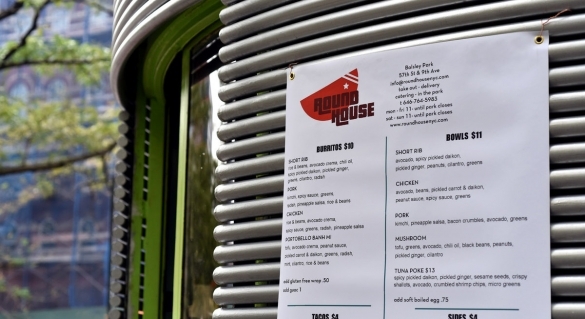 With a soft opening scheduled there today, Roundhouse, a new eatery, promises to bring renewed life to this corner at 57th Street and 9th Avenue. Located on Manhattan’s West Side, Balsley Park – formerly known as Sheffield Plaza – was transformed from a barren, lifeless plaza into the community’s most cherished common ground. Following public outcry and many failed attempts to redesign the plaza, Thomas Balsley Associates built community consensus around a new park-like image and design program that reached a broad constituency. The program – kiosk, café, lawn, garden, green market and toddler area – and security were strengthened with a singular move; a transverse path that exposes the sites desire lines and taps the neighborhood’s sidewalk energy. Like the Roundhouse’s new culinary offerings, the studio’s park design concept of fusion has re-emerged; fusion orchestrated between people and designed elements offering an escape from the order of the city and its grid. Brightly colored ribbon walls and pipe screens present a playful park-edge-alternative to the adjoining buildings. The highly visible cylindrical kiosk remains strategically located at the corner to overlook both the park and sidewalk activities. Balsley Park transcends mere in-situ offerings – you may now take a piece of it with you.